Arithmetic includes all of the foundational mathematic concepts which are not only essential to succeeding in college but also for common, daily tasks like splitting a bill, creating a budget, and taking measurements. This section of the Next-Generation ACCUPLACER test will measure your level of command of these essential mathematic skills. Where Do I Register for the Next-Generation ACCUPLACER? Since this will be administered by the college you plan to attend (or by your high school), you will register and schedule your appointment directly with that institution. Luckily, this test is free to students so you can register at your convenience. Just make sure you leave yourself enough time before the appointment to prepare for the test! 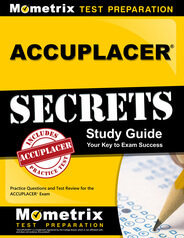 Prepare with our ACCUPLACER Study Guide and Practice Questions. Print or eBook. Guaranteed to raise your score. Get started today! How Much Time Do I Have for this Section of the Test? Fortunately, you will have much time as you need to get through the test. This is an especially good thing since the test covers a lot of ground and you aren’t going to be able to use a calculator throughout most of it. Since it is untimed, there isn’t really any way to say exactly how long you will spend on the test. With that said, you can probably expect to spend somewhere between four to six hours on the test itself. Add another 15 minutes for checking in before your appointment and then add in time for any breaks you might take. For the arithmetic section itself, you’ll probably need somewhere between 45 and 60 minutes to get through all 20 questions. If you’re really quick at computing numbers on paper, you might be able to get through it in even less time than that. Which Subjects Are in this Section? Most of this should already be familiar to you since you first encounter it very early on in your education and it forms the foundation of more advanced math classes. However, even if you know all or most of the operations required, you should still work on your computation skills. ACCUPLACER Flashcards. 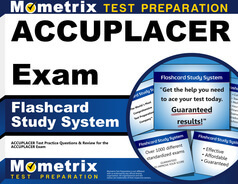 Proven ACCUPLACER test flashcards raise your score on the ACCUPLACER test. Guaranteed. There is no calculator allowed so you have to perform all operations by hand on scratch paper. That means you need to be extra careful about checking for mistakes. Fortunately, with the multiple choice structure, you’ll be able to tell if you went wrong somewhere based on whether or not the result you got is one of the optional answers. But you still need to double check your work because they will often include common wrong answers based on mistakes or miscalculations that people are likely to make. At the lower end, the easiest questions will be at a high school level. The most difficult questions you’ll see will be at a first or second year college level. As long as you study material within that range of difficulty levels, you should be able to handle just about any question you might see. What Is the Minimum Passing Score for the Math Arithmetic Section? This is not a pass/fail test but some schools may have established their own cutoff score. You need to check with your academic advisor what, if any, cutoff exists. If so, make sure to plan your study sessions accordingly so that you can meet or exceed that minimum on your first attempt. Given the length of the test, you want to do your best to avoid retaking the test. Moreover, some schools charge a fee for retaking the test. Even though that fee is usually modest, you can save yourself the time and money by preparing for the test in advance and taking all the time you need on the first attempt. The possible score on this section will range from 20 to 120. That is not a raw score reflecting the actual number of correct answers you got. Instead, it’s an adaptive store representing the average difficulty level of the questions you answered, and whether the answers were right or not. Basically, the testing program determines what level of question to show you next based on how well you did on the previous question. If you answer correctly, the next question will increase in difficulty. If you answer incorrectly, the next question will be a little easier. What Should I Study to Prepare for the Math Arithmetic Section? The arithmetic section will require you to improve your skills in solving basic math problems, most of which will seem pretty simple. However, remember that you will not be able to use a calculator so you need to get comfortable with performing those calculations by hand. Doing it by hand means that there is a higher chance for error so you also need to get in the habit of double checking all of your work to make sure you didn’t put a decimal in the wrong place or accidentally write down an incorrect number. So the best way to prepare for this section is to use a resource like the Mometrix Study Guide which comes with tons of practice questions that you can use to practice your skills. Each of these problems comes with clear explanations of the answers which have been thoroughly researched by a team of experts who are not only highly knowledgeable in the subject but also in the art of test taking itself. That means you’ll learn just as much from the answers you get wrong as the ones you get right! For even more practice, pick up a set of Mometrix Flashcards. The cards include even more practice questions as well as straightforward explanations of all the essential math concepts and formulas you need to know, including basic arithmetic and number logic. You’ll have plenty of opportunities to strengthen your arithmetic skills with these two study aids.